Virginia Democratic Governor Ralph Northam has defended calling slaves “indentured servants” in his first TV interview since a racism scandal broke. On Monday Mr Northam, who has admitted to wearing blackface, said a historian told him to refer to America’s first black slaves as such. Plans have meanwhile stalled to impeach Virginia’s Lt Gov Justin Fairfax, who is accused of sexual assault. The state capitol has been plunged into turmoil by the twin scandals. 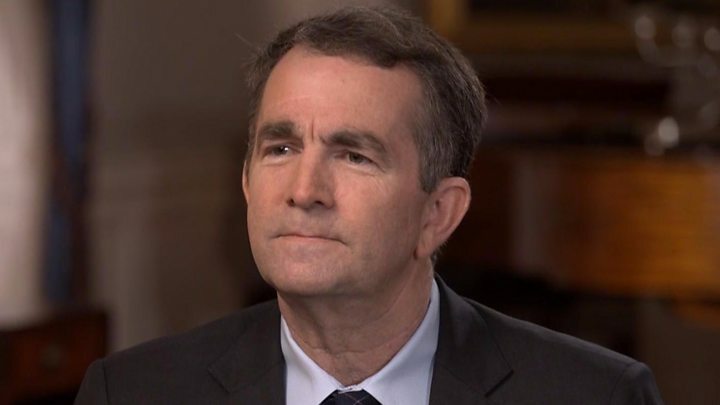 During the CBS interview aired in full on Monday, Mr Northam was grilled over his college yearbook photo, which shows two people – one wearing blackface makeup and the other in Ku Klux Klan robes. Mr Northam was asked why he initially apologised for the photo before backtracking and denying he was either in the picture. “When you’re in a state of shock like I was, we don’t always think as clearly as we should,” Mr Northam said, adding that he had “overreacted” by issuing an immediate apology. “I will tell you that later that night I had a chance to step back, take a deep breath, look at the picture and said, ‘This is not me in the picture’,” he said. Mr Northam has already admitted that he once “darkened his face as part of a Michael Jackson costume” on a separate occasion in 1984. The governor’s damage-limitation efforts risked making matters worse when he told the interviewer that 400 years has passed since the “first indentured servants from Africa landed on our shores”. According to Encyclopedia Virginia, which is produced in partnership with the Library of Virginia, the first Africans to arrive in Virginia were sold in exchange for food in August 1619 from the English ship White Lion. Unlike indentured servants, who were typically released after paying off the debt of their voyage to America, black slaves were rarely freed. After the interview aired on Monday, Mr Northam released a statement defending his word choice. He said that during a recent speech he “referred to them in my remarks as enslaved”. The scandals have rocked the state’s capitol, Richmond, which was also the capitol of the pro-slavery Confederacy during the US Civil War. Mr Northam’s deputy, Lt Governor Justin Fairfax, has been accused of sexual assault by two separate women. On Monday a Democratic-led impeachment effort against Mr Fairfax, who is black, appeared to stall after lawmakers announced that they would hold off for until further consultations are completed. Virginia Delegate Patrick Hope, who wrote draft impeachment articles, said on Monday that he had spoken to his colleagues who helped him determine that “additional conversations need to take place before anything is filed”. Democratic Delegate Marcus Simon, who has called on Mr Fairfax to resign, told the Wall Street Journal that he believes there is no precedent in Virginia history to impeach a governor, and that more research must be done on the legal process. “Frankly, a lot of us feel sort of helpless to do anything about the chaos around here. I just don’t know this is the right thing to be doing,” Mr Simon said. Over the weekend Mr Fairfax, who denies the allegations, called for an FBI investigation into the accusations. The number three in Virginia’s government, Democratic Attorney General Mark Herring, is also in hot water after admitting to wearing blackface to a university party in 1980.